Q: What are the areas to be renovated during phase 1? 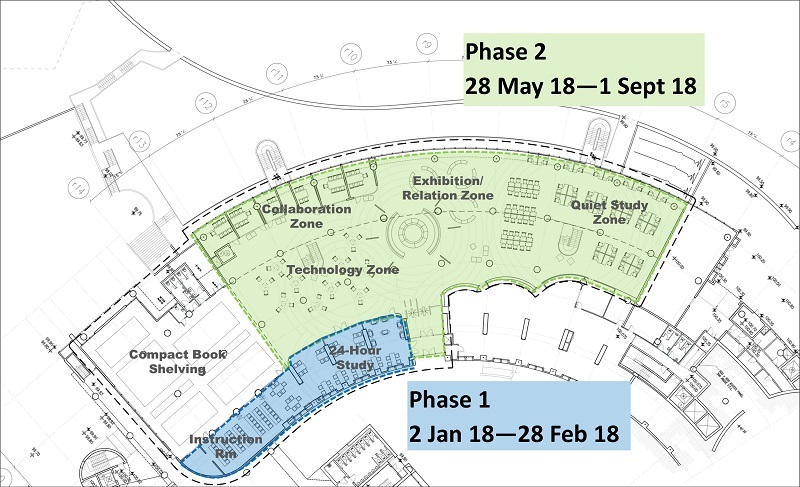 A: Phase 1 renovation covers the WHO Collections, Computer Room, the Group Study Rooms and the CALLab and the left-hand side of the main entrance between the 2 sets of glass doors. Q: Are there changes to the opening hours during the renovation period? A: The Medical Library will maintain normal opening hours during the whole renovation period. Please click here to see the hours. Q: Will I be able to access and borrow books during the renovation period? A: Yes, users have full access to all book / journal / audio-visual collections for reading or borrowing. Q: Will there be services not available and are there alternatives? Relocated to end of Compact Shelving. Booking suspended until after the renovation period. uPrint printers are relocated to the KNC and print jobs can be sent from any computer at the KNC. Booking suspended. Please use sofa area for discussions. Q: Hoardings have been put up near the CALLab. Will they block the emergency exit outside the room? A: Safety is always at top priority among our service standards. The hoardings will not block any emergency exits and there are doors along the hoardings which can be pushed open should an emergency arises. Q: Will study areas be open? A: All the study tables in open areas and single study rooms are open but the booking and use of the group study rooms will be suspended.